This entry was posted in Book Reviews and tagged Daniel Dern, James S.A. Corey, The Expanse by Mike Glyer. Bookmark the permalink. The title refers to Tiamat, a primordial goddess associated with creating the cosmos from chaos in ancient Babylonian mythology. The entity has been described as a serpent or dragon. According to the myth recorded on ancient cuneiform tablets, the deity Enki captured and killed Tiamat’s partner, Abzû. As a display of her wrath, Tiamat created eleven monsters of her own offspring to wage war against the deities and avenge her mate’s death. My library’s copies just arrived, and I’ll be one of the first to get one, yay! I was really impressed with Persepolis Rising, and am looking forward to this one. I rage-quit this series at Nemesis Games as it exceeded my Maximum Acceptable Deaths number. I’ve considered going back since there is a lot I loved about the series. The things noted here, also the characters are wonderful. We will see. @bookworm1398, if it helps, nothing on that scale happens again. In fact, one of my few issues with the last three books is that the aftermath of book 5 fades into the background awfully fast as the story moves on to other places. @JJ, if you liked the last one, this is very much a sequel to that and builds on it in ways I really dug. The basic premise from page one is “evil empire vs. rebels” which is not exactly unheard of, but their approach to that is really interesting. @Daniel, I don’t know which of the stories/novellas you’ve read, but IMO “The Churn” is the best in terms of what it tells us about the world and one of the main characters, and “The Vital Abyss” contains possibly the best writing (not just of the short pieces, but of the whole series). The latest one, “Strange Dogs”, is fairly slight, but it does set up something that turns out to be a major plot point in Tiamat’s Wrath (although I still didn’t see it coming, because I’m a sucker). @JJ — I, too, did a look-up for Tiamat, but unlike various fantasies, this was, like the previous volumes’ titles, a literary or allegorical or whatever reference, no entity (or organization) named, nor nick-named, Tiamat, appeared in the text. @Bookworm – I hear you about threshholds. Too many of the detective/mystery shows we see on PBS seem to have, after the first murder, often one or two as part of the perp’s attempts to get away with it. @Eli – I’ve read The Churn, and agree, it was a very good, and fleshing-out, story. (Since I’ve signed up for a two-months-at-a-buck-each Kindle Unlimited trial, I’ll try to remember to go looking for them there, as well as through my library’s e-avenues.) (As if I didn’t already have enough to e-read, between Nebula noms (belatedly) and Hugo noms (per Mike’s post a few days ago, until the Hugo packet info arrives). 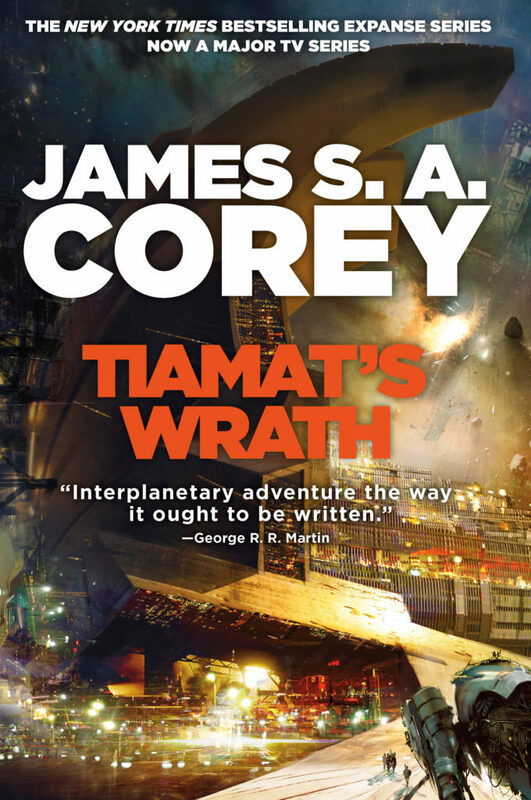 I’m pretty sure “Tiamat” is going to be the nickname for the entity that caused the extinction of the protomolecule creators, much as “Caliban” was the nickname for the zombie humans created by contact with the protomolecule. I think I enjoyed this book better than any other volume in the series. @Greg: The name Caliban is never mentioned in Caliban’s War(*), even though I think the reference is meant to be as you say (and the TV show made it more explicit by saying that the researchers used it as a codename for their project). All of the book titles in the series have fairly clear allegorical meanings, but they’re never actually referenced in the text. I’ve just started it, but I’m disgruntled by gur gvzr whzc, vafgrnq bs fgnegvat ng gur pyvss-unatre raqvat sebz gur ynfg obbx. @Darren: I didn’t see the ending of Persepolis Rising as a cliffhanger. There’s been a defeat, and most of the main characters have found a place to regroup and figure out what to do next; nothing’s imminently happening. And then in the last chapter, one character meets the antagonist and they talk about what to do next, but those are long-range plans. I guess it’s a cliffhanger if you think maybe some new allies might swoop in and save the day at the very last minute, but I think what Corey are suggesting by their choice of where to start the next book is that sometimes that doesn’t happen and you have to just go on with life for quite a while. I was talking about the cliffhanger with a superadvanced alien race (or their technology) revealing themselves to be still active and pissed by humanity’s actions, intervening in a major battle. Pretty gigantic cliffhanger, IMHO. “Cliffhanger” normally means that a big suspenseful thing comes up at the very end. What you’re talking about happens two-thirds of the way through book 7 in response to a specific action, and then doesn’t happen again during the last third of the book when that action isn’t repeated. So, yes, it’s a suspenseful open question, or a cliffhanger, or whatever you want to call it – but we’ve already seen time go by without the thing recurring, as long as those people don’t repeat that action. And it’s established in book 8 that they haven’t done so during the period of time we skipped over, because things have been basically peaceful during that time (and that apparent stability, with people going on with their lives the way they usually don’t do in “evil empire” stories, is pretty important to the novel IMO). But the mysterious threat has definitely been on their minds that whole time. I think the time jump works fine; otherwise there’d just be a lot of “and then another year went by, and they were still worried about the thing, but it still hadn’t happened again.” And I enjoyed the process of figuring out how the characters had gotten into the new roles they’re in. YMMV but I’d say just give it a little time.